It's what makes a Subaru, a Subaru. Subaru (スバル) is the automobile manufacturing division of Japanese transportation conglomerate Fuji Heavy Industries Co., Ltd. (FHI). Founded in 1917, by Chikuhei Nakajima (中島 知久平, 1884-1949), as "The Aircraft Research Laboratory" (later "Nakajima Aircraft Company, Ltd."), the company became a major supplier of aircraft to the Government of Japan during World War II. Reorganized as Fuji Sangyo after the war, the company began to manufacture buses, scooters, and automobiles. 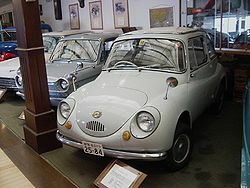 Its first car, released in 1954, was the Subaru P1 (later renamed 1500). 3 Subaru of America, Inc.
Subaru drew on its experience with airplanes and developed innovations such the horizontally-opposed boxer engines used in most of their vehicles. In 1996, the company decided to utilize all wheel drive (AWD) in most international markets as standard equipment. Benefiting from the growing popularity of outdoor activities, the versatile Subaru vehicles achieved greater popularity in the United States than they did in Japan. Subaru is known for its environmental initiatives, such as building the first auto assembly plant to achieve zero landfill status; offering vehicles that meet California and New York emission standards for sale in every state; developing energy efficient hybrid vehicles; and providing a recycling plan for their "end-of-life" cars. Subaru is named after the star cluster Pleiades; the Japanese name "Subaru," roughly translated into English means, "to govern," "unite," or "gather together." The company logo is inspired by the star cluster. The large star in the logo represents Fuji Heavy Industries, and the five smaller stars represent the current five companies that are united under the FHI group. 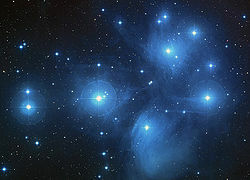 In Japan, the company also goes by the name Mutsuraboshi ("Six Stars"), the name given to the Pleiades in very old Japanese texts such as Kojiki and Man'yōshū and literature such as Makura no Sōshi. Chikuhei Nakajima (中島 知久平, Nakajima Chikuhei, January 1, 1884-October 10, 1949), a Japanese military officer, engineer, and politician, founded the Aircraft Research Laboratory in 1917. Reorganized as "Nakajima Aircraft Company, Ltd.," in 1931, the company was a major supplier of airplanes to the Government of Japan during World War II. Nakajima served as Japan's Minister of Commerce and Industry until Japan's surrender at the end of the war. He died in 1949, and is buried in Tama Cemetery near Tokyo. At the end of World War II, Nakajima Aircraft was again reorganized as Fuji Sangyo Company, Ltd., and concentrated on meeting the need for cheap transportation in Japan. In 1946, Fuji Sangyo created the Fuji Rabbit S-1 motor scooter, using spare aircraft parts left over from the war. The design was based on the Powell motor scooter being used in Japan by American servicemen. The Rabbit was an immediate success with the Japanese public. 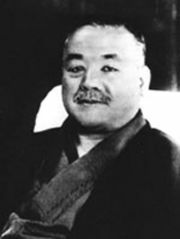 The Japanese Government's 1950 Corporate Credit Rearrangement Act (anti-zaibatsu legislation) divided Fuji Sangyo into 12 smaller corporations. Between 1953-1955, four of these corporations, Fuji Jidosha (a coachbuilder specializing in bus manufacture), Omiya Fuji Kogyo (an engine manufacurer), Utsunomiya Sharyo (a chassis manufacturer) and Tokyo Fuji Dangyo (a trading company) merged with Fuji Kogyo (a scooter manufacturer) to form Fuji Heavy Industries (富士重工業株式会社; Fuji Jūkōgyō Kabushiki-kaisha) (TYO: 7270), or FHI. Kenji Kita, the CEO of Fuji Heavy Industries at the time, wanted the new company to be involved in car manufacturing. Kita canvassed the company’s employees for possible names for its first car, the Subaru P1, in 1954, but none of the proposals was appealing. In the end, Kita gave the car a Japanese name that had been his personal favorite from childhood, “Subaru.” The P-1 (the name was later changed to the Subaru 1500) was powered by a four-cylinder engine and had a front-wheel wishbone-type independent suspension. It was the first car designed in Japan with a monocoque ("single shell" in French) body, utilizing the external shell to support much of the weight. Sales were temporarily suspended when FHI encountered financial difficulties, but in 1958, a second car, the Subaru 360, was introduced. Called the “Ladybird” because of its ladybug shape, the compact 360 became very popular, and remained in production for 12 years. From 1954 to 2008, the company designed and manufactured dozens of vehicles including the P1 (1954), the tiny air-cooled 360 (1958), the Sambar (1961), the 1000 (1965), the R2 (1969), the Leone (1971), the Domingo (1983), the Alcyone (1985), the Legacy (1989), the Impreza (1993), the Sambar EV electric van (1995), the Forester (1997), the Tribeca (2005), and the Subaru Exiga in 2008. The first Subaru mini-truck, the Sambar, launched in 1961, offered compact size with a spacious cargo bed. It was soon followed by the Sambar Light Van, built for both commercial and leisure use. The Subaru 1000, launched in 1965, was the first vehicle to incorporate Subaru’s trademark drive technology: a front-wheel-drive system coupled to a horizontally opposed “boxer engine” derived from aircraft technology. By the end of the 1960s, Subaru North America had begun importing to the United States. In the 1970s, Subaru introduced the GL/DL (the Leone in other markets), followed by a coupe and a station wagon, that offered four-wheel-drive (4WD) capability for the first time in a vehicle for everyday use. Especially suitable for use in the snow and in hilly regions, the GL and DL benefited from the growing popularity of outdoor sports like skiing and fishing, and became the world's top-selling 4WD vehicle. In 1977, Subaru successfully launched the Brat, a small pick-up based on the GL, with a pair of jump seats in the cargo bed. During the 1980s, Subaru released a series of versatile and unique vehicles; and Fuji Heavy Industries developed the first electronically controlled continuously variable transmission (CVT, a transmission which can change steplessly through an infinite number of effective gear ratios between maximum and minimum values). Early in 1987, Subaru launched the Justy, the first car with an ECVT. In 1989, the Justy became the first production car in the U.S. to offer CVT technology. Subaru continues to use CVT in its light automobiles (keicars), as well as supplying it to other manufacturers. During the 1990s, Subaru introduced the high-performance SVX, the popular Legacy-based Outback wagon, and the sporty Impreza. Subaru AWD vehicles combine high performance with versatility, and boast some of the best crash test scores in the automotive world. In 1968, when the Japanese government under Prime Minister Eisaku Sato mandated the merger of Japanese auto industry firms to improve competitiveness, Nissan acquired a 20 percent stake in Fuji Heavy Industry. Nissan utilized FHI's bus manufacturing capability and expertise to expand its Nissan Diesel line of buses. Many Subaru vehicles, even today, use parts manufactured by Nissan. The Subaru automatic transmission, known as the “4EAT,” is also used in the first generation Nissan Pathfinder. Upon Nissan's acquisition by Renault in 1999, its 20 percent stake was sold to General Motors. During the period of General Motors ownership, a modified Impreza was sold in the United States as the Saab 9-2X. An SUV (Subaru Tribeca / SAAB 9-6X) was also planned but the SAAB version did not proceed. On October 5, 2005, Toyota Motor Corporation purchased 8.7 percent of FHI shares from General Motors. General Motors later sold its remaining 11.4 percent stake on the open market, to sever all ties with FHI. After the purchase, Toyota announced a contract with Subaru, to use the underutilized Subaru of Indiana Automotive manufacturing facility in Lafayette, Indiana, and plans to set aside an assembly line for the Camry model and hire 1,000 workers. On April 10, 2008, Toyota increased its stake in FHI to 16.7 percent and announced the end of mini-car (keicar) production at its facility in Gunma Prefecture. Daihatsu, a subsidiary of Toyota, will instead supply the cars to FHI. In the United States, Fuji Heavy Industries owns Subaru of America, Inc., Subaru Research & Development, Inc., and Subaru of Indiana Automotive, Inc. In 1965, Malcolm Bricklin, an entrepreneur, began offering franchises for distributorships selling motor scooters, including the Fuji Rabbit. In 1967, when Fuji Heavy Industry sold their Rabbit factory to Israel, Bricklin made an arrangement with Subaru to import the tiny Subaru 360 to the United States. Bricklin and his partner, Harvey Lamm, formed Subaru of America, Inc. to sell Subaru franchises. In the 1970s, Subaru moved away from small commercial vehicles and developed mainstream passenger car models. The Subaru Legacy, introduced in the United States in 1990, was well received. Subaru continued its new direction with the controversially styled six-cylinder Subaru Alcyone SVX (1992) and the Subaru Impreza (1993). From 1995 to 2000, Subaru ran a series of advertisements for the newly developed Subaru Outback, starring Australian actor Paul Hogan, which highlighted Subaru's all wheel drive, and depicted the Outback in a number of rugged Australian locations. As a result of this advertising campaign, Subaru products began to attract a following among the young and educated, as a lightweight, affordable, economical SUV alternative. During the 2000s, the Subaru Outback wagon, based on the Legacy and modified with SUV-like stance, bumpers, and roof, became one of the best selling wagons in the United States. 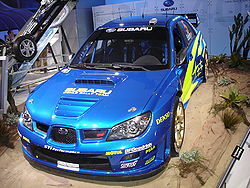 Modified versions of the Impreza WRX and WRX STi have been competing successfully in car rallies; drivers Colin McRae, Richard Burns, and Petter Solberg have won World Rally Championship titles with the Subaru World Rally Team. The Subaru World Rally Championship cars are prepared and run by Prodrive, the highly successful British Motorsport team. Several endurance records were set in the early and mid-1990s by the Legacy. For the 1990 Formula 1 season, Subaru fielded the Subaru Coloni C3B. It featured a 12 cylinder boxer engine, but was not competitive because of horsepower and weight disadvantages. Owing to the increased interest in rally racing, the Subaru Impreza WRX, introduced in 2001, was successful in bringing high performance, AWD compact cars into the sports car mainstream. At the 2007 Frankfurt International Motor Show, Subaru displayed a variable vane (variable geometry turbocharger), common rail turbodiesel boxer engine, the world's first production horizontally-opposed water-cooled diesel engine. Volkswagen made only 2 air-cooled boxer prototype diesel engines that were not turbocharged, and installed one engine in a Volkswagen Beetle Type 1 and another in a Volkswagen Type 2. The Subaru engine is rated at 110 kW (147 hp) and 350 Nm (258 ft lb) with a displacement of only 2.0 liters. Subaru claims to have implemented environmental initiatives such as recycling, reducing harmful emissions, and educating their employees. The Subaru plant in Lafayette, Indiana (SIA), was the first auto assembly plant to achieve zero landfill status; every by-product of its manufacturing is reused and recycled; nothing goes into a landfill. The company has also developed energy efficient hybrid vehicles, and a recycling plan for their "end-of-life" cars. According to the official Subaru website, "In 2006, SIA was awarded the U.S. EPA's Gold Achievement Award as a top achiever in the agency's WasteWise program to reduce waste and improve recycling." The website claims that SIA "has also become the first U.S. automotive assembly plant to be designated a wildlife habitat. Deer, coyotes, beavers, blue herons, geese, and other animals live there in peaceful coexistence with the Subaru plant." Subaru also offers Partial Zero Emissions Vehicle (PZEV)—certified Legacy, Outback, and Forester models which are available for sale anywhere in the U.S. Subaru PZEV vehicles meet California's Super-Ultra-Low-Emission Vehicle exhaust emission standard and have 90 percent cleaner emissions than the average new vehicle. Subaru PZEV vehicles achieve such tight pollution controls, and the burning of fuel is so complete, that in very smoggy urban areas, exhaust coming out of the tailpipe may actually be cleaner than the surrounding air. According to the EPA, Outback, Forester, and Legacy are among the cleanest and most fuel-efficient vehicles available in the U.S. based on air pollution, greenhouse gas emissions, and overall fuel economy. North America/Europe/Oceania/Middle East/Asia/Japan Subaru models, permanent all wheel drive with boxer engine. An article posted by Autoblog on April 16, 2008 stated that due to the corporate investment by Toyota, all kei cars built by Subaru would be replaced by Daihatsu models beginning in 2010. On April 10, 2008, Toyota approximately doubled its stake in FHI to 16.5 percent, and announced a collaboration between Toyota and Subaru on a 2-door coupe that will be sold in Japan only as a Toyota, and internationally as a Subaru. ↑ Subaru Global, Origins of Subaru name. Retrieved June 27, 2008. ↑ Fuji Rabbit, History. Retrieved June 27, 2008. ↑ Subaru Global, Inspiration of naming first Subaru vehicle. Retrieved June 27, 2008. ↑ 4.0 4.1 4.2 Edmunds, Subaru. Retrieved June 27, 2008. ↑ Edmunds, Saab 9-6X Gets the Go-ahead. Retrieved June 27, 2008. ↑ Edmunds, Saab Developing Smaller Crossover After Collapse of Subaru Alliance. Retrieved June 27, 2008. ↑ The Japan Times, Shimizu Kaho, Toyota to buy Fuji shares in GM selloff. Retrieved June 27, 2008. ↑ Forbes, Japan's Fuji Heavy shares rally on expanded alliance with Toyota group. Retrieved June 27, 2008. ↑ Cars101, Malcolm Bricklin Resource Page. Retrieved June 27, 2008. ↑ ltv-vwc.org.uk, The Diesel Beetle. Retrieved August 2, 2008. ↑ AutoBlogGreen, Geneva Motor Show: Subaru diesel boxer engine. Retrieved June 27, 2008. ↑ 13.0 13.1 Subaru, Subaru and the Environment. Retrieved June 27, 2008. ↑ Autoblog, Subaru to stop making Kei Cars. Retrieved August 2, 2008. ↑ Autoblog.com, Subaru RWD coupe will be sold worldwide, Toyota version only in Japan. Retrieved June 27, 2008. Davis, Pedr, and Tony Davis. Subaru the Innovator Downunder. Sydney: Marque, 1991. ISBN 9780947079277. Farmer, Gavin. WRX Imprezive: Subaru's Turbo Legend. Punchbowl, N.S.W. : Bookworks, 2002. ISBN 9781876953102. Long, Benjamin. Backtracking by Foot, Canoe, and Subaru Along the Lewis and Clark Trail. Seattle: Sasquatch Books, 2000. ISBN 9781570612466. Long, Brian. Subaru Imprezia: The Road Car and WRC Story. Dorchester: Veloce, 2006. ISBN 9781845840334. This page was last modified on 30 September 2014, at 22:09.